The Federal grazing fee for 2018 will be $1.41 per animal unit month (AUM) for public lands administered by the Bureau of Land Management and $1.41 per head month (HM) for lands managed by the USDA Forest Service. The 2017 public land grazing fee was $1.87. An AUM or HM--treated as equivalent measures for fee purposes--is the use of public lands by one cow and her calf, one horse, or five sheep or goats for a month. The newly calculated grazing fee was determined by a congressional formula and takes effect March 1, 2018. The fee will apply to nearly 18,000 grazing permits and leases administered by the BLM and nearly 6,500 permits administered by the Forest Service. The formula used for calculating the grazing fee was established by Congress in the 1978 Public Rangelands Improvement Act and has remained in use under a 1986 presidential Executive Order. Under that order, the grazing fee cannot fall below $1.35 per AUM/HM, and any increase or decrease cannot exceed 25 percent of the previous year's level. The annually determined grazing fee is established using a 1966 base value of $1.23 per AUM/HM for livestock grazing on public lands in Western states. 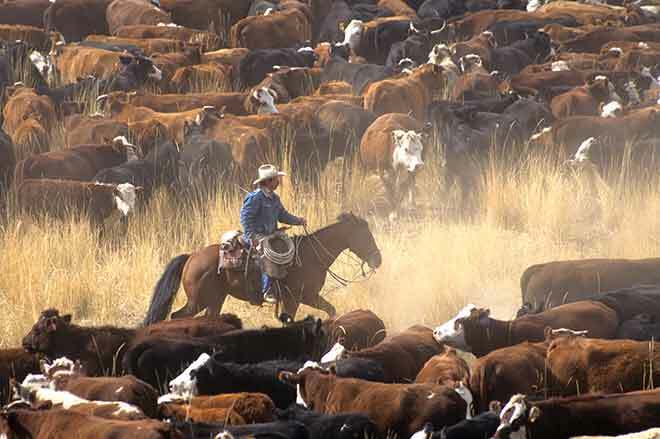 The figure is then calculated according to three factors--current private grazing land lease rates, beef cattle prices, and the cost of livestock production. In effect, the fee rises, falls, or stays the same based on market conditions. The BLM and Forest Service are committed to strong relationships with the ranching community and work closely with permittees to ensure public rangelands remain healthy, productive working landscapes. Fifty percent of the collected grazing fees deposited into the U.S. Treasury are returned to the Range Betterment Fund for on-the-ground range improvement projects. Portions of collected fees are also returned to the states for use in the counties where the fees were generated. The grazing fee applies in 16 Western states on public lands administered by the BLM and the Forest Service. The states are: Arizona, California, Colorado, Idaho, Kansas, Montana, Nebraska, Nevada, New Mexico, North Dakota, Oklahoma, Oregon, South Dakota, Utah, Washington, and Wyoming.